A.P.J Abdul Kalam was a brilliant visionary who was highly respected in the fields of aerospace engineering and physics. Kalam made massive contributions to ISRO (Indian Space Research Organization) as well as DRDO (Defense Research and Development Organization). Kalam was also actively involved in India’s military missile development efforts as well as the civilian space program. Kalam was fondly known as the ‘Missile Man of India’ for his contribution on the development of the launch vehicle technology as well as the ballistic missile. Kalam’s quotes are known to encourage and motivate young and budding minds and Kalam’s adages had an immense influence on the general public. 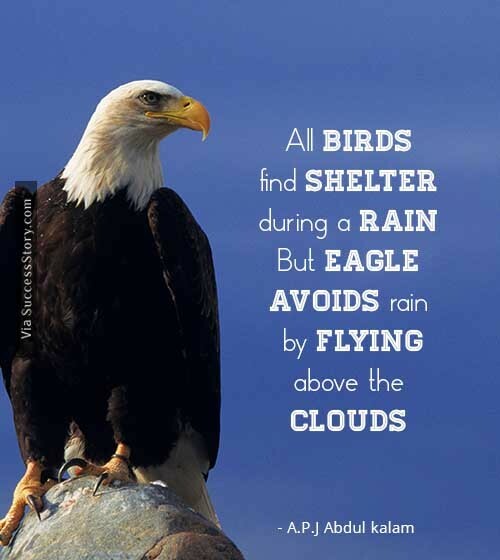 "All Birds find shelter during a rain.But Eagle avoids rain by flying abovethe Clouds"